The Proof Positive quilt block features a patch that is not used frequently, but is a step up in difficulty from the half square triangle unit. It is often called a three quarter square triangle patch, as it is comprised of three triangles to make the square. 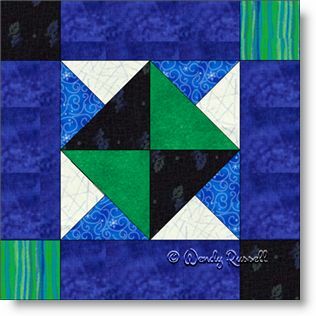 Half square triangle pieces are used as well as quarter square triangles to make the four patches (the three quarter square triangle units) required for the centre of the quilt block. The completed block is constructed as an uneven nine patch. The sample quilts illustrated show layouts of the blocks in a straight set, using four blocks together to make one unit and then adding that unit as a single block, and finishing up with sashing to separate the blocks. The second layout shows the blocks set on point with a variety of coloured triangles and squares to fill out the quilt. This creates a very different look than the blocks set side by side.